The bathroom was completely stripped out then made bigger to accommodate the 300 litre thermal store (hot water cylinder). Even though the store is insulated we decided that the bathroom was the best place to benefit from any heat loss. 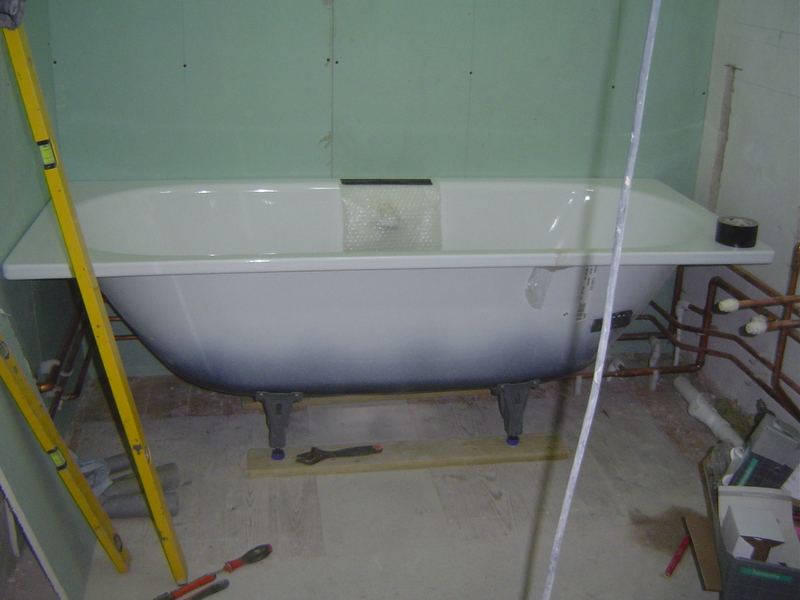 We chose a Kaldewei steel enamel bath. 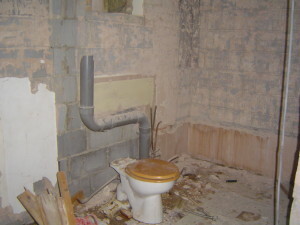 It is very robust and comes with a 30 year guarantee. The model is an Eco water saving 105 Classic Duo – water volume 110 litres (average displacement 70 litres). Combining the double ended bath with a filler that is integrated with the overflow it means no one gets stuck with the tap end and shared baths are much more fun. 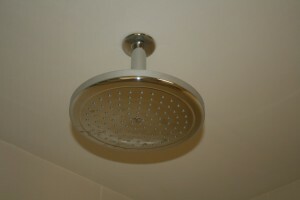 The shower is a Hansgrohe EcoSmart Raindance Select S120 shower with a flow rate of 9 litres/min. These EcoSmart products mix air with the water to give a satisfying shower whilst using less cold water and importantly less hot water. 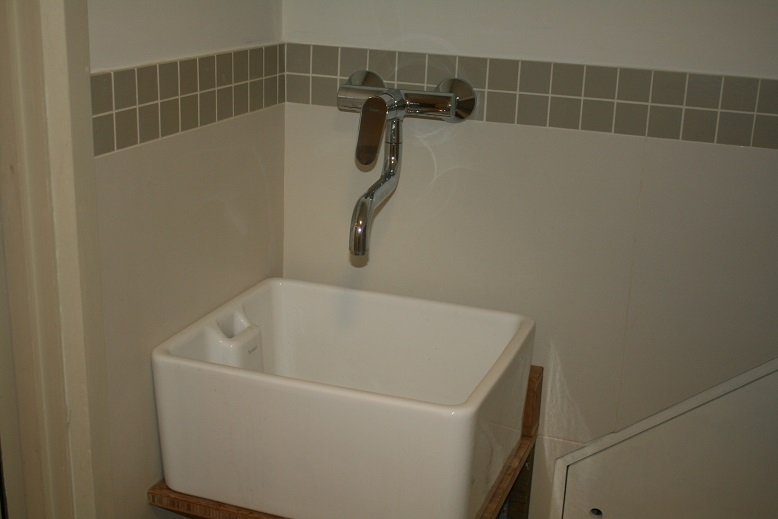 The tap is a Hansgrohe Talis E single lever basin mixer with a flow rate of 3.5 litres/min. 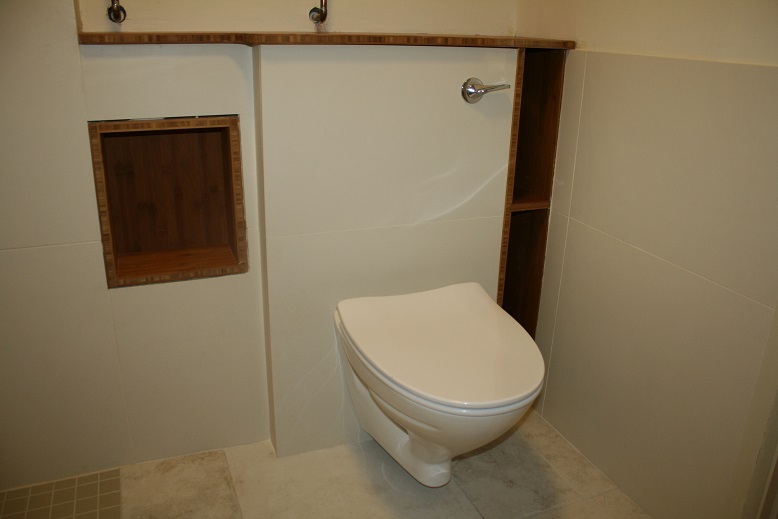 The loo is Flushwise Twyford Gallerie wall hung with a 4/2.6 litre dual flush. 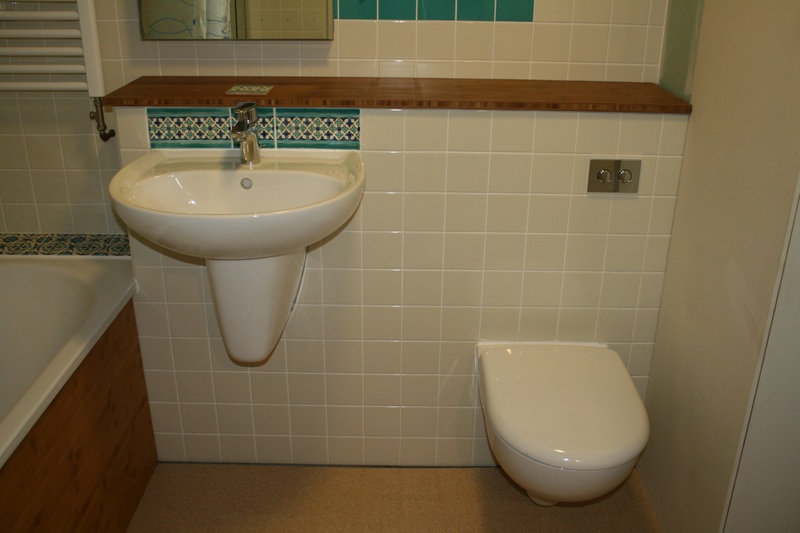 The flush is operated by two buttons; a long flush (4 litres) and a variable flush. In keeping with our 1960′s house and supporting sustainable cork forests we chose cork for the bathroom floor from Granorte. 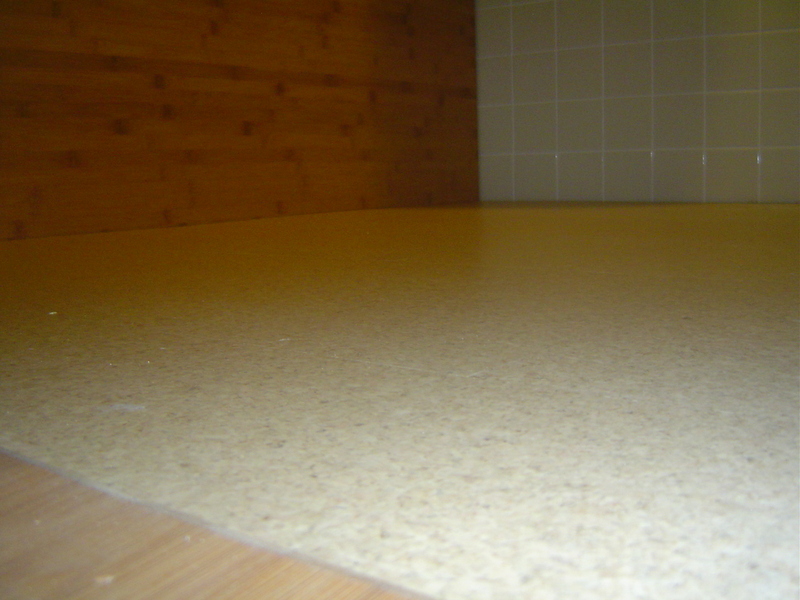 You might describe it as engineered cork as it is made up of three layers: cork, fibreboard and cork. 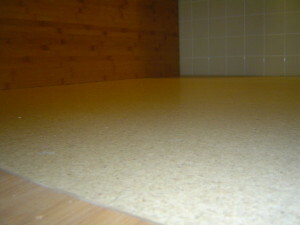 It is a floating floor that is not fixed down but merely clicks together using the Uniclic system. 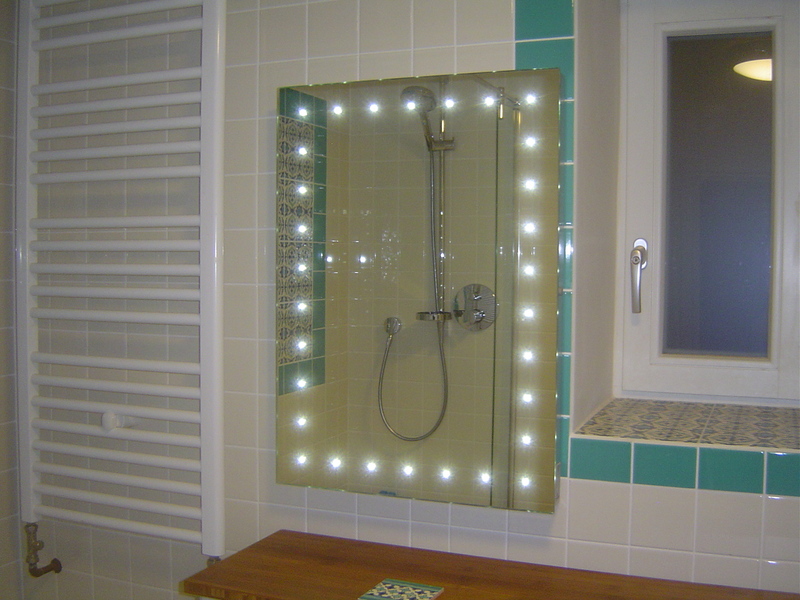 We chose an Astral LED lit mirror with a shaver socket and de-mister pad from www.HiB.co.uk (36.7 Watts). On the very rare occasion that one of us might have a long soak in the bath it would be nice for the water to stay warm for longer. 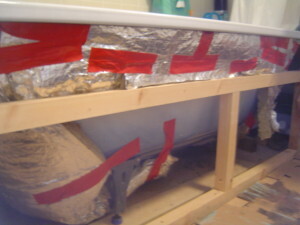 We added some left over insulation to the bath in the hope that it will keep it just a bit warmer for longer. 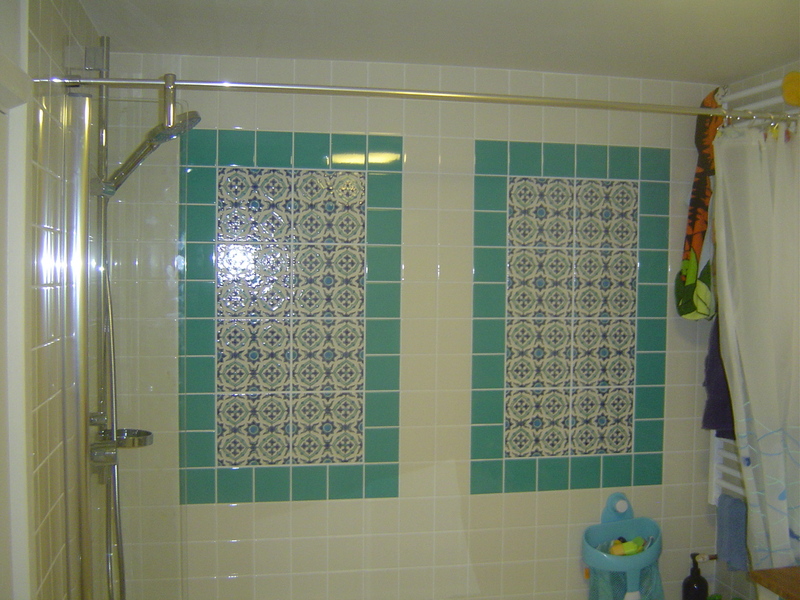 We bought the patterned tiles in the FireEarth factory sale and the others from their shop on the Woodstock Road. Hansgrohe Cromo 220 EcoSmart overhead shower – 9 litres/minute. 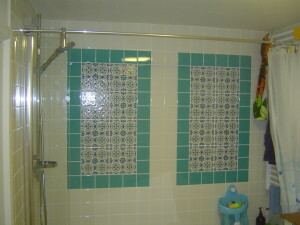 Frustratingly at the time of writing we don’t yet have a shower screen so haven’t been able to try our new shower. 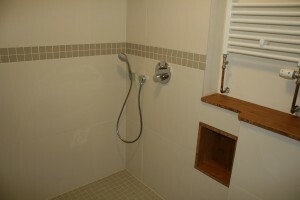 Hansgrohe Crometta 85 Green 1 jet EcoSmart hand shower – 6 litres/minute. 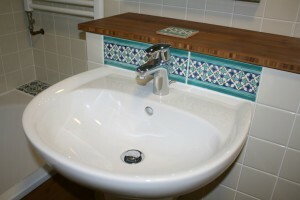 Twyford Bathrooms belfast sink. Hansgrohe tap. 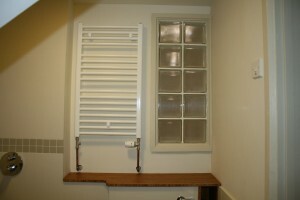 Ifo wall hung ES4 WC – dual flush 4/2.7 litre supplied by www.greenbuildingstore.co.uk. 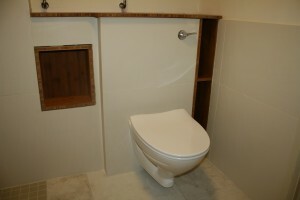 To achieve the short flush (2.7 litres) it is necessary to hold the handle down during the flush. If you operate the handle and let go it delivers the long flush (4 litres). We put our Miele A+++ washing machine under the stairs to maximise space. Given the absence of a window to the outside we have sought to bring natural light in by using these glass blocks. 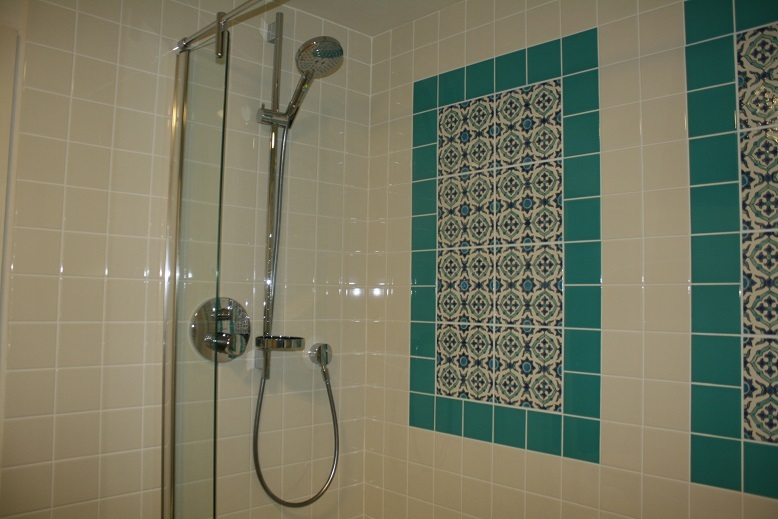 Giacomo from Impero Ceramics (07729 725 860) did a great job tiling the shower room. 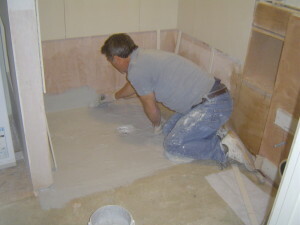 Here he is applying the tanking to the shower area. 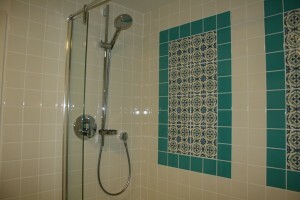 This entry was posted in Bathroom, Blog, Water saving. Bookmark the permalink.